This article is about the man made of bronze in Greek mythology. For other uses, see Talos (disambiguation). In Greek mythology, Talos, also spelled Talus (/ˈteɪlɒs/; Greek: Τάλως, Talōs) or Talon (/ˈteɪlɒn, ən/; Greek: Τάλων, Talōn), was a giant automaton made of bronze to protect Europa in Crete from pirates and invaders. He circled the island's shores three times daily. 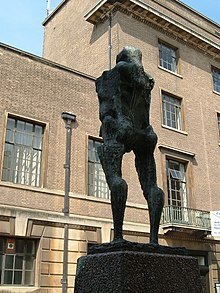 Talos's bronze nature suggested to the author of Bibliothēkē that he may have been a survivor from the Age of Bronze, a descendant of the brazen race that sprang from meliae "ash-tree nymphs" according to Argonautica 4. The conception that Hesiod's men of the Age of Bronze were actually made of bronze is extended to men of the age of gold by Lucian for humorous effect. The pseudo-Platonic dialogue Minos rationalized the myth, thrice yearly showing at each village in turn the laws of Minos inscribed on brass tablets. Talos is said to have been made by Hephaestus at the request of Zeus, to protect Europa from people who would want to kidnap her. According to Cinaethon in his poem, Talos was the son of Cres (son of Idaea and Zeus) and the father of Hephaestus who also fathered Rhadamanthys. According to Brian A. Sparkes, "The most detailed treatment in literature is to be found in the Argonautica ... however, we have detailed images of the episode, 150 years earlier, dated to around 400 BCE." In the Cretan dialect, talôs was the equivalent of the Greek hêlios, the Sun: the lexicon of Hesychius of Alexandria notes simply "Talos is the Sun". In Crete, Zeus was worshipped as Zeus Tallaios, "Solar Zeus", absorbing the earlier god as an epithet in the familiar sequence. The god was identified with the Tallaia, a spur of the Ida range in Crete. 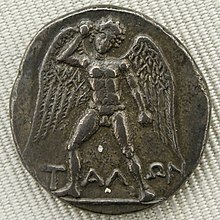 On the coin from Phaistos (illustration) he is winged; in Greek vase-paintings and Etruscan bronze mirrors he is not. The ideas of Talos vary widely, with one consistent detail: in Greek imagery outside Crete, Talos is always being vanquished: he seems to have been an enigmatic figure to the Greeks themselves. Talos is described by Greeks in two versions. In one version, Talos is a gift from Hephaestus to Minos, forged with the aid of the Cyclopes in the form of a bull. In the other version, Talos is a gift from Zeus to Europa. Or he may have been the son of Kres, the personification of Crete; in Argonautica Talos threw rocks at any approaching ship to protect his island. In the Byzantine encyclopedia called the Suda, it is said that when the Sardinians did not wish to release Talos to Minos, he heated himself – by jumping into a fire – and clasped them in his embrace. Talos had one vein, which went from his neck to his ankle, bound shut by only one bronze nail. The Argo, transporting Jason and the Argonauts, approached Crete after obtaining the Golden Fleece. As guardian of the island, Talos kept the Argo at bay by hurling great boulders at it. According to pseudo-Apollodorus' Bibliotheke, Talos was slain when Medea the sorceress either drove him mad with drugs, or deceived him into believing that she would make him immortal by removing the nail. In Argonautica, Medea hypnotized him from the Argo, driving him mad with the keres she raised, so that he dislodged the nail, and "the ichor ran out of him like molten lead", exsanguinating and killing him. Peter Green, translator of Argonautica, notes that the story is somewhat reminiscent of the story regarding the heel of Achilles. In Argonautica, Apollonius notes that "the ichor... ran out like molten lead". A. B. Cook first suggested that the single vein closed by a nail or plug referred to the lost-wax method of casting. Robert Graves (whose interpretation of Greek mythology is controversial among many scholars) suggests that this myth is based on a misinterpretation of an image of Athena demonstrating the process of lost-wax casting of steel, which Daedalus would have brought to Sardinia. The Talos Principle, a narrative-based puzzle videogame. ^ "Talos". Random House Webster's Unabridged Dictionary. ^ Brian Sparkes, The Red and The Black: studies in Greek pottery (Routledge) 1996:124. ISBN 0-415-12661-4, ISBN 978-0-415-12661-8 ; two late fifth-century vase paintings depicting the death of Talos are discussed by M. Robertson, "The death of Talos", Journal of Hellenic Studies 97 (1977:159f). ^ Karl Kerenyi, The Gods of the Greeks 1951:110. ^ Martin P. Nilsson noted that "Talos is evolved out of an old Cretan god, who became identified with Zeus" and concluded that, like Cronus, Zeus Tallaios belongs certainly to the pre-Greek stratum (Nilsson, "Fire-Festivals in Ancient Greece" The Journal of Hellenic Studies 43.2 [1923, pp. 144–148], p. 148); A. B. Cook, Zeus: God of the Bright Sky I, 729ff. treats Zeus Tallaios. ^ In a note in Bibliotheke, vanquished by an arrow shot by Poeas to his vulnerable heel; in Argonautica, vanquished by the magical arts of Medea. In Attic and South Italian vase-paintings, the Dioscuri, flank his falling figure; no literary source mentions them in connection with Talos (Thalia Phillies Howe, "Sophokles, Mikon and the Argonauts" American Journal of Archaeology 61.4 [October 1957, pp. 341–350], p. 347 and notes). ^ Pausanias, noting the unorthodox genealogy of Talos given by Cinaethon, remarks "The legends of Greece generally have different forms, and this is particularly true of genealogy." ^ Bibliotheke 1.9.26; this is the source of the later impression that Talos was an automaton. ^ Only in Argonautica 4 and in Eustathius, according to H. de la Ville de Mirmont, Apollonios de Rhodes: les Argonautiques: traduction française suivie de notes critiques (Paris and Bordeaux) 1892:402, noted in J. Douglas Bruce, "Human Automata in Classical Tradition and Mediaeval Romance" Modern Philology 10.4 [April 1913, pp. 511–526], p. 513 and note. ^ According to a fragment of the early poet Cinaethon of Sparta, for whom Talos was the father, not the creation, of Hephaestus; it was noted by Pausanias (VIII.53.2, .5). ^ The Talos episode in Argonautica 4. ^ Nilsson 1923:148 compares the stories told by Hellenes of the bronze Molech at Carthage. ^ Green, The Argonautika: Apollonios Rhodios 2007:355, notes to 4:1638ff. ^ Cook, Zeus vil. I (1914:723f). ^ Graves, The Greek Myths (1955) 1960 §92.8. Wikimedia Commons has media related to Talos.